Sky is the limit when experimenting with the tangzhong method. Up to now, I dare to say that I nearly bake every bread with tangzhong. Yes, I confess I’m really addicted to baking this super soft and fluffy tangzhong bread. Tangzhong is absolutely a reliable method to help me bake all kinds of Asian buns and breads. Many of my friends who are bake lovers continue to experiment it with different fillings. Raisins and walnuts are wonderfully good pairings. Why not try these two ingredients in my tangzhong bread baking? The trial was a big success. The two big raisin and walnut loafs were gone quicker than I thought. Mix raisins with rum well. Cover and place at room temperature overnight. Place walnuts in a pre-heated oven at 180C (356F). Bake for 8 to 10 minutes until hot enough but not brown. Remove from oven. Use a clean towel or wear a pair of plastic gloves to rub off the outer skins. Roughly chop into pieces, or leave it if you want more chunky texture. Select the “dough” mode (refer to the manual of your breadmaker to select the kneading dough programme). When all ingredients come together, add in the butter. (Note: my breadmaker has an alert function to remind me of adding fruits or nuts. If your breadmaker doesn’t have any function like this, just put in the raisins and walnuts when the butter has been absorbed well.) Knead until the dough becomes elastic. Then let the dough complete the 1st round of proofing, about 40 minutes, best temperature for proofing is 28C, humidity 75%, until double in size. Transfer the dough to a clean floured surface. Deflate and divide into 6 equal portions. Knead into ball shapes. Cover with cling wrap, let rest for 15 minutes at room temperature. 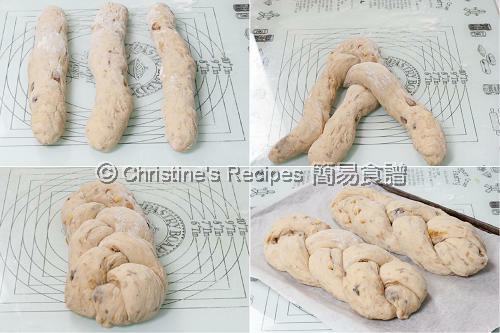 7.Use 3 portions to braid as follows: Take the left dough to cross over the middle piece. Cross the right piece over to the middle (as picture shown). Repeat these steps until you reach the end. Pinch ends and tuck both ends underneath. Repeat the same process with the other 3 portions. Place two loafs on a baking tray lined with baking paper. Cover with cling wrap and let proof for about 45 minutes, until double in size. Brush whisked egg on top. Bake in a pre-heated oven at 180C (356F) for about 30 to 35 minutes, until the loafs are golden brown. Let the breads cool on a wire rack completely. It’s better to remove the skin of walnuts before use, otherwise you’d taste a bit of bitterness. 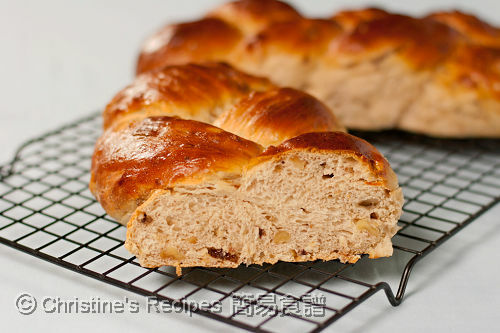 Christine, this bread looks awesome, so light and fluffy, love the raisin and walnut in it. Beautifully done! I am just waiting for xmas holidays to start baking this type of bread. Yes, it's because the rum and the raisins made the bread a bit darker. But the smell was really good. Sorry for confusing you. I sometimes melted butter in microwave oven, sometimes just left butter at room temperature until it turned really soft. Either way would work. Just add the butter, melted or softened, as you like. Nicely braided! Seems like tangzhong has really taken the bread-making enthusiasts by storm! 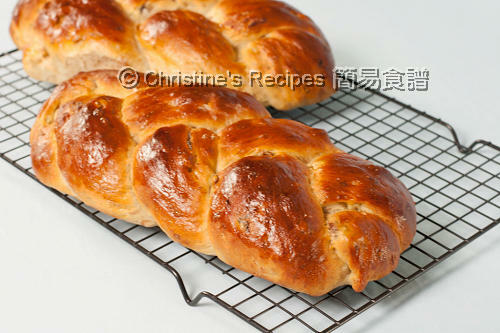 Christine, your bread looks sooo soft and fluffy .... really must give tangzhong another shot! With the breadmaker to help you make the dough, when you shape by hand, do you need to add in more flour when the dough is too wet and soft? Or if you continue to knead by hand a little longer, it won't be so sticky? When the dough has been kneaded enough in my breadmaker, it doesn't need any more kneading actually. When shaping and rolling the dough, I need to sprinkle a bit of flour on the outside. Try to sprinkle as minimum as I can, for I don't want to affect the texture of the end results. This bread looks magnificent! I can't think of a better bread to have on the counter for the holiday season, to grab a slice in the morning with coffee! What beats a trial that is great success! I would like this with coffee for breakfast. Love your posts- especially bread posts as I'm exploring this territory of baking. How would you suggest going about the tangzhong method if I don't have a bread machine? How do you suggest going about the tangzhong method if I don't have a bread machine? Other than using a breadmaker, there are choices. Use KitchenAid. Or use your most convenient tools: your two hands. Thanks for your message. This is one of my favourite bread. I like the nutty and mellow taste of walnut. I mostly use over night dough method and bake it next day. Perhaps you can add in malt extract it will enhance the flavour of the bread. Due to hectic schedule, I seldom use braiding technique to decorate the dough. Bread stamp is my favourite decorating tool. Keep up your excellent work. Merry Xmas. Hi Christine! Your bread looks yummy! I would love to try it but am wondering if I can substitute the rum with other forms of liquid? The rum will give an extra fragrance to this bread. If you don't have any rum, you can skip it or replace it with 2 tablespoons of water with white grape juice. Can I use vanilla extract or red wine instead of rum? Or should I just use water? Normally, we use rum to add flavour and moist to raisin. Assume that the flavour of red wine doesn't match. Soaking them in a bit of water could help prevent from being too dry. Hi Christine, do you recommend any particular brand/model of bread maker? Looking at your recipes makes me REALLY want to get a bread maker! (I tried doing it manually and it's taking too long). Thanks! I used Sunbeam, the very basic model. Quite good. I have to restart the sunbream breadmaker and knead my dough for two cycles, totally about 30 to 40 minutes until I get a dough with thin membrane. Recently, I bought another bread machine from Aldi, a local store nearby, I just love it. Its brand is Lumina. It's got two blades inside. I found its kneading function perfectly good. It helps knead the tangzhong dough to thin membrane stage within 20 minutes. I'm using Zojirushi bread machine and for the dough function, there is actually a resting period of 20min before the actual kneading starts. Will it affect the tangzhong and other ingredients? Really? 20 minute wait is quite long actually. My 1st attempt to make bread and I think I need to tweak the time and temperature cos my bread didnt tun out soft and fluffy and my dough came out from the machine still rather sticky! Oh, one more question! Have you tried baking bread using tangzhong recipe direct from the bread maker? I often bake my breads, except loafs, in my oven, as the crust of the bread baked from bread maker tends to be more thicker and harder.